Spring has definitely arrived in my kitchen. While the weather in my area is stuck in winter I have been making an effort to start using spring vegetables in my recipes. There is something about making spring foods that always puts me in a better mood and makes me think ahead to the warmer months. My mother-in-law brought me down 2 pounds of ramps which I will be cleaning and posting about in the next couple of days. Spring onions are always a sure sign that the weather will be turning warmer soon. Pesto is a food that I make a lot of in the spring. There are so many flavor combinations that can be created and it is great on pasta, chicken or beef. Since my two boys are both in stages where they love pasta (and little else some days) I have been making most of my pesto to serve with pasta. Last week I tried new recipe for Orecchiette with Scallions and Pistachio Pesto from Food and Wine magazine. This recipe has 8 ingredients. It takes 30 minutes of total time, all of which is active and makes 6 servings. 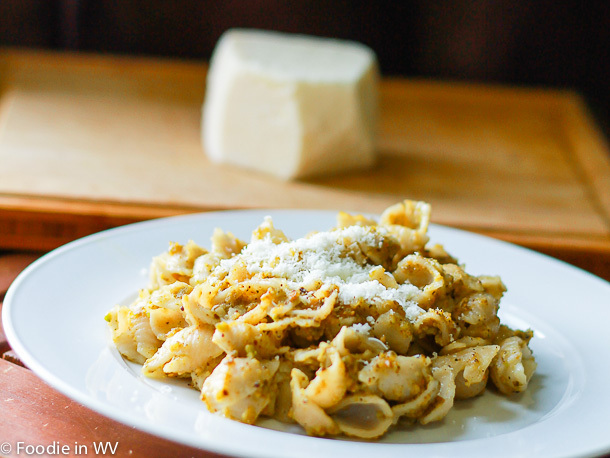 Since I eat gluten free I used gluten free orecchiette for this recipe. The recipe was very straight forward and I didn't make many changes. I did find that I had to add a significant amount of salt to the pesto in order for the flavors to come through. This was in addition to adding salted pistachios. Pesto can seem bland when not salted properly. I am a bit salt phobic, except when it comes to pesto. It really does need the taste of the salt in order for the other flavors to shine. I had never tried gluten free orecchiette before. I sort of wish that I hadn't. There are a number of great gluten free pastas. I love brown rice ziti and spaghetti, however the orecchiette pretty much fell apart. With regular pasta this recipe would be delicious though and a great way to add a vegetarian menu option to your weekly meal plan. The pesto part of the recipe would also be delicious with chicken or fish if you are looking for a meat option. For the recipe go to Orecchiette with Scallions and Pistachio Pesto. Pistachio Pesto... your recipes always make me want to say ooohh. Sometimes I think I do, lol. This sounds and looks great. Thanks :) It is different and a nice turn of pace from traditional pesto! Love the addition of pistachio pesto in your pasta dish. It sounds wonderful. It really is great and the taste of the pistachios gives it a nice nutty undertone. Oooh, another pesto. This one looks wonderful too. You have so many terrific ideas. Thanks for all the sweet comments :) I love pesto! Love the addition of pistachio. And, the pasta has the wonderful shape that holds in those flavors. I love the pistachios too, they are one of my favorite nuts! Oh wow! Pistachio Pesto? This sounds and looks terrific, and so different. It really is different and great! This looks wonderful. I'm excited to be a new GFC follower.